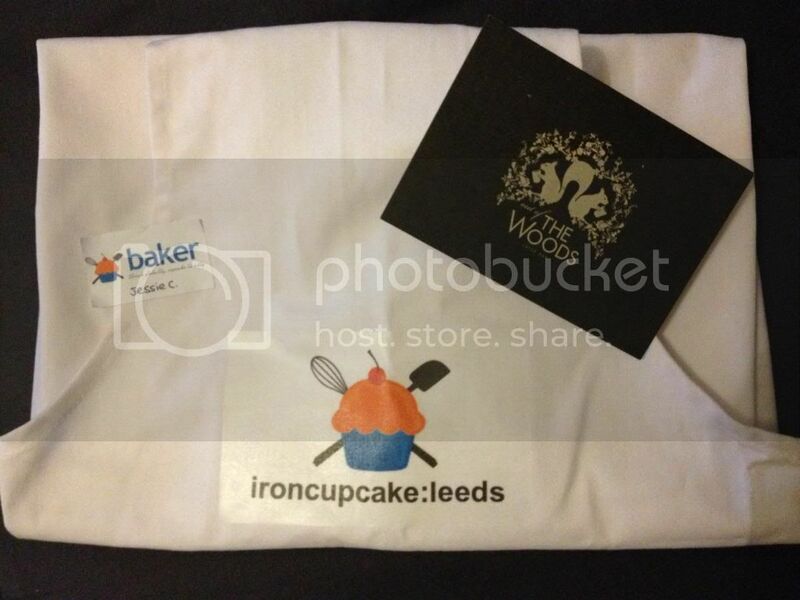 Mad Hatter's Pantry: Iron Cupcake: Leeds - DISNEY!!! This weekend I tried something new. I visited Iron Cupcake: Leeds for the first time and I'm so very glad I did! I will definitely be going back! 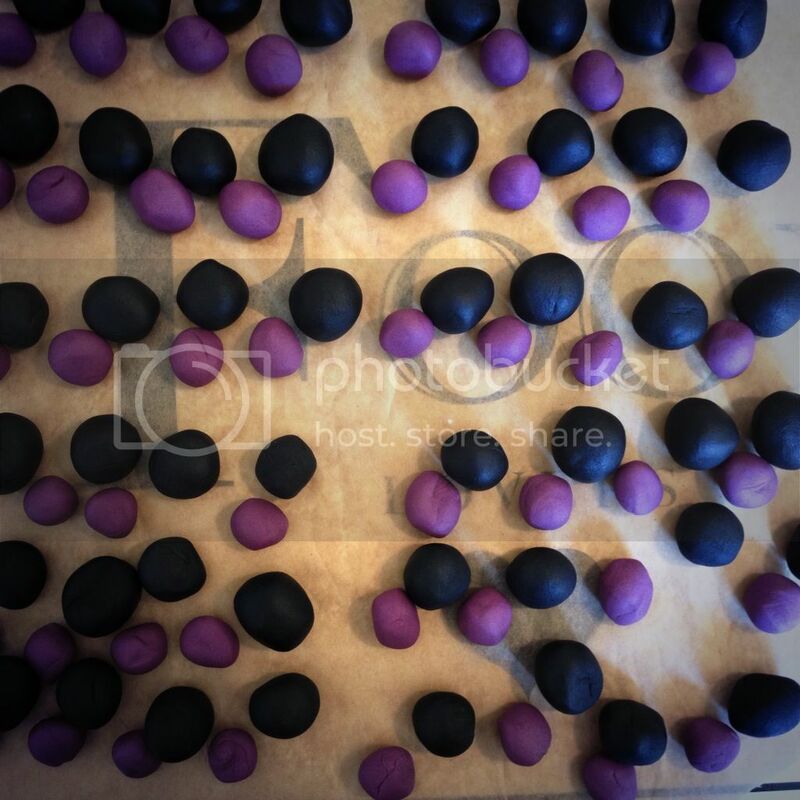 Iron Cupcake: Leeds is a cupcake competition held at The Adelphi in Leeds where cake lovers can gather and indulge in their passion for cake. Whether you like to bake, eat, or both there is something for you! (Being vegan, I decided to stick to the Baker option as I would only have been able to judge my own cakes as an Eater!) To my astonishment, I won Best in Show!!! Check out the other entries here. I stumbled across the website a few months ago and thought it was a nice idea. "But how could I compete with all these ever so fancy cakes on the website" (a recent picture showed a cupcake decorated with a slab of chocolate emblazoned with a golden butterfly!! ), I thought to myself. "No, I'll just look at the pretty pictures and see who wins the next competition - maybe I'll be good enough to enter sometime in the future." The entries all looked so professional! And then one word changed everything. That word was Disney. How could I pass up the opportunity to make a DISNEY themed cupcake? Disney movies have been in my favourites for as long as I can remember, how could I possibly not enter? So, full of trepidation and excitement, I bought my first Baker ticket. And so the planning started. Which Disney film should I take my inspiration from? What would translate well into cupcake form? What would stand out from what everyone else would be planning? So my Pocahontas idea went out of the window. I brainstormed a few ideas and landed upon the idea of a Disney Villains cake. 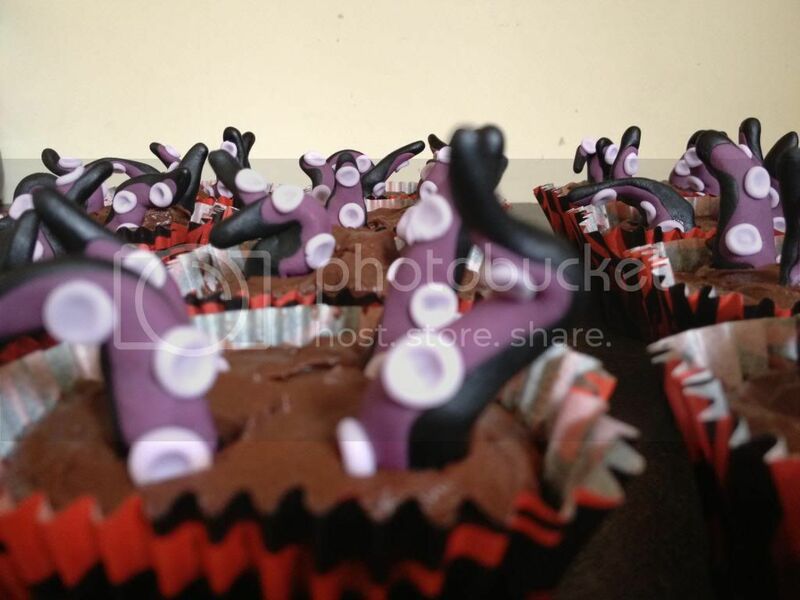 The villains are always so much fun - I could get away with doing a sinful cake! I remembered a recipe in one of my cookbooks (Lilli Vanilli in A Zombie Ate My Cupcake) that I had wanted to try for a while - Devil's Food. However, as with a lot of cake cookbooks it was full of non-vegan ingredients. Challenge time! I replaced the sour cream with yogurt and adjusted a few measurements to get the right consistency. To replace the eggs, first I tried using flax seeds but it made the cake a bit stodgy so instead I used the reliable old soy milk & apple cider vinegar trick. It worked perfectly! 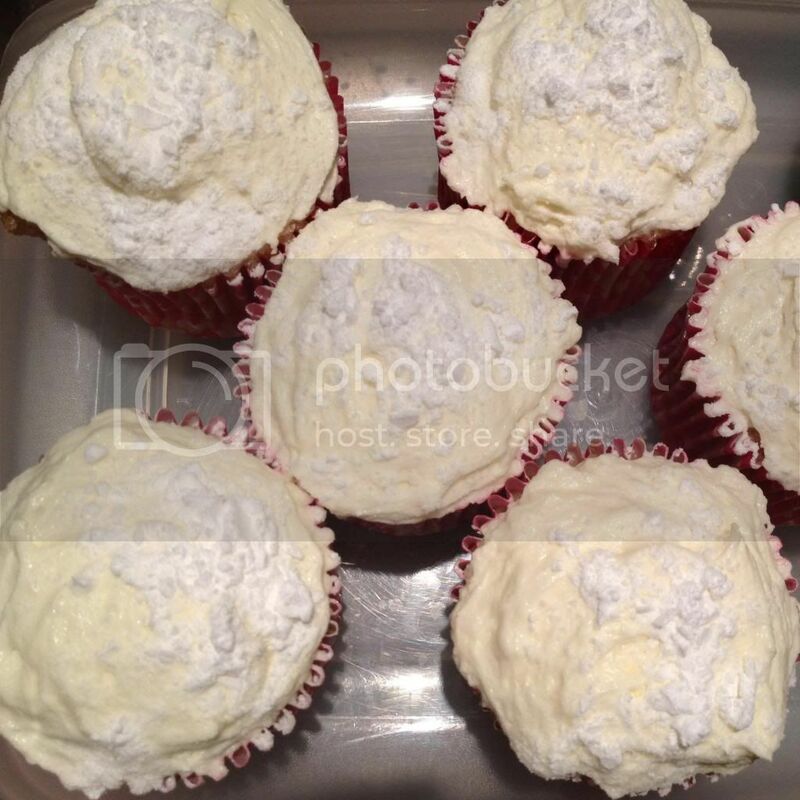 So I made my cupcakes and iced them and packed them up to take to Leeds. And I was pretty proud of them. I didn't think they were award-winning but I was pretty damn happy that they had turned out how I had imagined. And then I got to Leeds, opened the box and I could have cried. 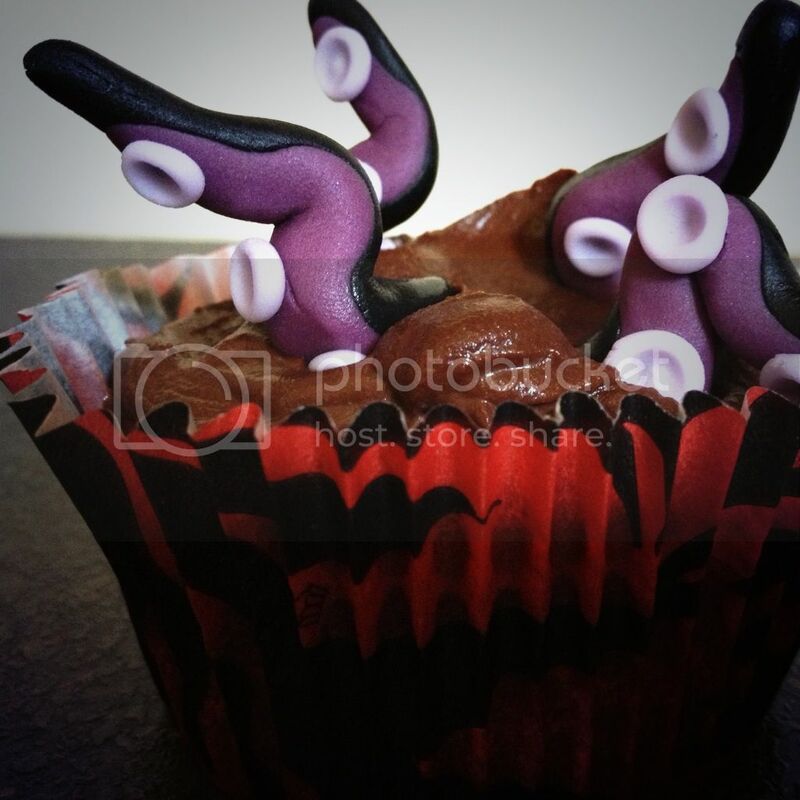 My tentacles had started to melt. What could I do? I wasn't about to give up and go home. The only thing I could do was set up and treat it as a learning curve. And text my hubby to tell him how I'd messed up while I sat and waited for the judging to start. 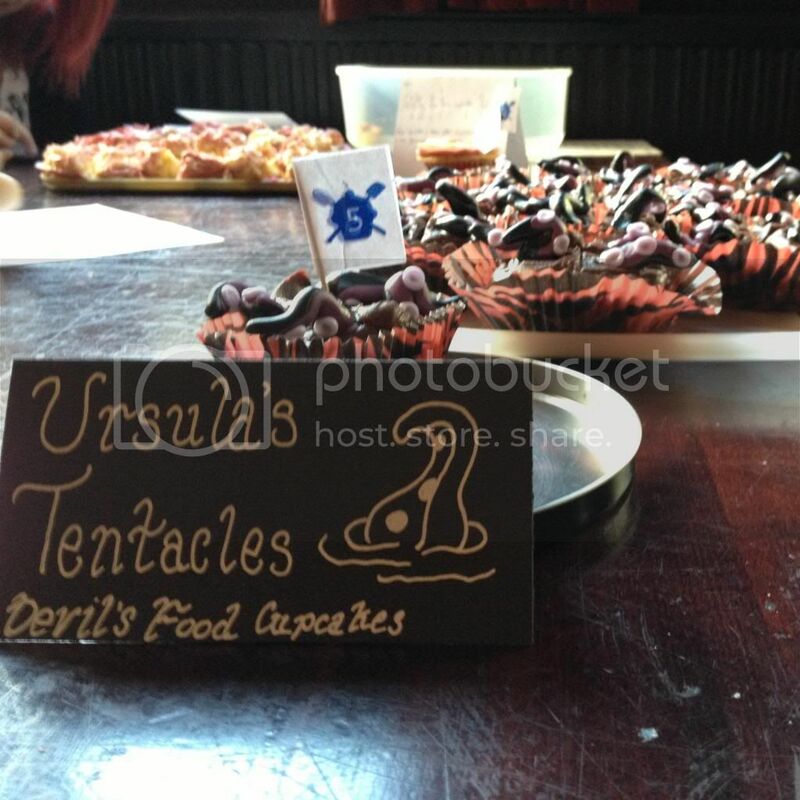 It turns out people loved the melted tentacles!! 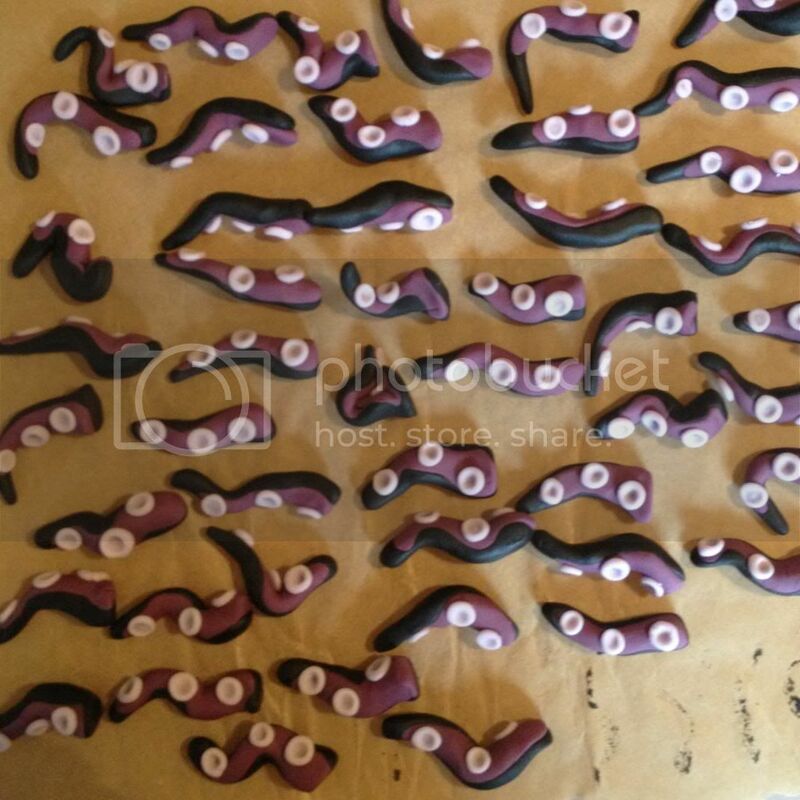 It made them look wet and I had a few people ask what they were made out of as they no longer looked like standard sugarpaste. Massive sigh of relief! After that initial panic, the rest of the evening was very enjoyable. I even had the courage to talk to a couple of people I didn't know! I can definitely see this becoming a regular event in my calendar. Maybe I'll even convince the other half to come eat some cake next time. Maybe. Before I knew it, results time rolled around and we all anxiously gathered around Charlotte to hear who had won the prizes. The cakes are judged on taste, decoration and how well they fit the theme - as well as a Baker's Choice, judged by bakers, and an overall winner who received the most votes across the categories. I had my fingers crossed for theme (if anything!) as I was happy that my villains cakes fit the theme well. But I didn't win taste. I didn't win decoration. I didn't win theme or Baker's Choice. "Oh well, I tried. I'll just have to try harder next time." Thank you to everyone who's said nice things about my baking and been supportive with my crazy experiments - without you, I wouldn't have the confidence to enter things like this! 2. Mix together the soy milk and apple cider vinegar and set aside to curdle. After 5-10 min it will look thick and a little lumpy - this is good. 2. Remove from the heat and mix in the sugar and salt. Quickly add the soy yogurt and lemon juice, stirring until combined. Make sure you add it before the chocolate starts to set! Set the mixture aside to cool (or pop on the fridge for a few minutes if you can't wait).